The following sketch, Hackney-Coach Stands, first appeared in The Evening Chronicle on Saturday, 31 January 1835. It was the first of a series of Sketches of London Charles Dickens had been commissioned to write by George Hogarth, the editor of The Evening Chronicle (and Dickens’s future father-in-law). Sketches by Boz. Scenes, Chapter 7. We maintain that hackney-coaches, properly so called, belong solely to the metropolis. We may be told, that there are hackney-coach stands in Edinburgh; and not to go quite so far for a contradiction to our position, we may be reminded that Liverpool, Manchester, ‘and other large towns’ (as the Parliamentary phrase goes), have their hackney-coach stands. We readily concede to these places the possession of certain vehicles, which may look almost as dirty, and even go almost as slowly, as London hackney-coaches; but that they have the slightest claim to compete with the metropolis, either in point of stands, drivers, or cattle, we indignantly deny. Take a regular, ponderous, rickety, London hackney-coach of the old school, and let any man have the boldness to assert, if he can, that he ever beheld any object on the face of the earth which at all resembles it, unless, indeed, it were another hackney-coach of the same date. We have recently observed on certain stands, and we say it with deep regret, rather dapper green chariots, and coaches of polished yellow, with four wheels of the same colour as the coach, whereas it is perfectly notorious to every one who has studied the subject, that every wheel ought to be of a different colour, and a different size. These are innovations, and, like other miscalled improvements, awful signs of the restlessness of the public mind, and the little respect paid to our time-honoured institutions. Why should hackney-coaches be clean? Our ancestors found them dirty, and left them so. Why should we, with a feverish wish to ‘keep moving,’ desire to roll along at the rate of six miles an hour, while they were content to rumble over the stones at four? These are solemn considerations. Hackney-coaches are part and parcel of the law of the land; they were settled by the Legislature; plated and numbered by the wisdom of Parliament. Then why have they been swamped by cabs and omnibuses? Or why should people be allowed to ride quickly for eightpence a mile, after Parliament had come to the solemn decision that they should pay a shilling a mile for riding slowly? We pause for a reply;—and, having no chance of getting one, begin a fresh paragraph. Our acquaintance with hackney-coach stands is of long standing. We are a walking book of fares, feeling ourselves, half bound, as it were, to be always in the right on contested points. We know all the regular watermen within three miles of Covent-garden by sight, and should be almost tempted to believe that all the hackney-coach horses in that district knew us by sight too, if one-half of them were not blind. We take great interest in hackney-coaches, but we seldom drive, having a knack of turning ourselves over when we attempt to do so. We are as great friends to horses, hackney-coach and otherwise, as the renowned Mr. Martin, of costermonger notoriety, and yet we never ride. We keep no horse, but a clothes-horse; enjoy no saddle so much as a saddle of mutton; and, following our own inclinations, have never followed the hounds. Leaving these fleeter means of getting over the ground, or of depositing oneself upon it, to those who like them, by hackney-coach stands we take our stand. There is a hackney-coach stand under the very window at which we are writing; there is only one coach on it now, but it is a fair specimen of the class of vehicles to which we have alluded—a great, lumbering, square concern of a dingy yellow colour (like a bilious brunette), with very small glasses, but very large frames; the panels are ornamented with a faded coat of arms, in shape something like a dissected bat, the axletree is red, and the majority of the wheels are green. The box is partially covered by an old great-coat, with a multiplicity of capes, and some extraordinary-looking clothes; and the straw, with which the canvas cushion is stuffed, is sticking up in several places, as if in rivalry of the hay, which is peeping through the chinks in the boot. The horses, with drooping heads, and each with a mane and tail as scanty and straggling as those of a worn-out rocking-horse, are standing patiently on some damp straw, occasionally wincing, and rattling the harness; and now and then, one of them lifts his mouth to the ear of his companion, as if he were saying, in a whisper, that he should like to assassinate the coachman. The coachman himself is in the watering-house; and the waterman, with his hands forced into his pockets as far as they can possibly go, is dancing the ‘double shuffle,’ in front of the pump, to keep his feet warm. The servant-girl, with the pink ribbons, at No. 5, opposite, suddenly opens the street-door, and four small children forthwith rush out, and scream ‘Coach!’ with all their might and main. The waterman darts from the pump, seizes the horses by their respective bridles, and drags them, and the coach too, round to the house, shouting all the time for the coachman at the very top, or rather very bottom of his voice, for it is a deep bass growl. 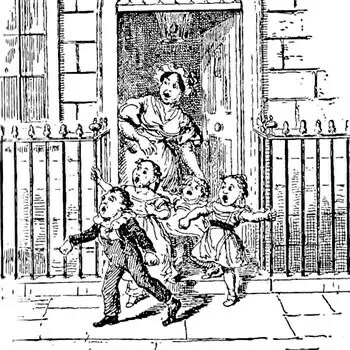 A response is heard from the tap-room; the coachman, in his wooden-soled shoes, makes the street echo again as he runs across it; and then there is such a struggling, and backing, and grating of the kennel, to get the coach-door opposite the house-door, that the children are in perfect ecstasies of delight. What a commotion! The old lady, who has been stopping there for the last month, is going back to the country. Out comes box after box, and one side of the vehicle is filled with luggage in no time; the children get into everybody’s way, and the youngest, who has upset himself in his attempts to carry an umbrella, is borne off wounded and kicking. The youngsters disappear, and a short pause ensues, during which the old lady is, no doubt, kissing them all round in the back parlour. She appears at last, followed by her married daughter, all the children, and both the servants, who, with the joint assistance of the coachman and waterman, manage to get her safely into the coach. A cloak is handed in, and a little basket, which we could almost swear contains a small black bottle, and a paper of sandwiches. Up go the steps, bang goes the door, ‘Golden-cross, Charing-cross, Tom,’ says the waterman; ‘Good-bye, grandma,’ cry the children, off jingles the coach at the rate of three miles an hour, and the mamma and children retire into the house, with the exception of one little villain, who runs up the street at the top of his speed, pursued by the servant; not ill-pleased to have such an opportunity of displaying her attractions. She brings him back, and, after casting two or three gracious glances across the way, which are either intended for us or the potboy (we are not quite certain which), shuts the door, and the hackney-coach stand is again at a standstill. We have been frequently amused with the intense delight with which ‘a servant of all work,’ who is sent for a coach, deposits herself inside; and the unspeakable gratification which boys, who have been despatched on a similar errand, appear to derive from mounting the box. But we never recollect to have been more amused with a hackney-coach party, than one we saw early the other morning in Tottenham-court-road. It was a wedding-party, and emerged from one of the inferior streets near Fitzroy-square. There were the bride, with a thin white dress, and a great red face; and the bridesmaid, a little, dumpy, good-humoured young woman, dressed, of course, in the same appropriate costume; and the bridegroom and his chosen friend, in blue coats, yellow waist-coats, white trousers, and Berlin gloves to match. They stopped at the corner of the street, and called a coach with an air of indescribable dignity. The moment they were in, the bridesmaid threw a red shawl, which she had, no doubt, brought on purpose, negligently over the number on the door, evidently to delude pedestrians into the belief that the hackney-coach was a private carriage; and away they went, perfectly satisfied that the imposition was successful, and quite unconscious that there was a great staring number stuck up behind, on a plate as large as a schoolboy’s slate. A shilling a mile!—the ride was worth five, at least, to them. What an interesting book a hackney-coach might produce, if it could carry as much in its head as it does in its body! The autobiography of a broken-down hackney-coach, would surely be as amusing as the autobiography of a broken-down hackneyed dramatist; and it might tell as much of its travels with the pole, as others have of their expeditions to it. How many stories might be related of the different people it had conveyed on matters of business or profit—pleasure or pain! And how many melancholy tales of the same people at different periods! The country-girl—the showy, over-dressed woman—the drunken prostitute! The raw apprentice—the dissipated spendthrift—the thief! Talk of cabs! Cabs are all very well in cases of expedition, when it’s a matter of neck or nothing, life or death, your temporary home or your long one. But, besides a cab’s lacking that gravity of deportment which so peculiarly distinguishes a hackney-coach, let it never be forgotten that a cab is a thing of yesterday, and that he never was anything better. A hackney-cab has always been a hackney-cab, from his first entry into life; whereas a hackney-coach is a remnant of past gentility, a victim to fashion, a hanger-on of an old English family, wearing their arms, and, in days of yore, escorted by men wearing their livery, stripped of his finery, and thrown upon the world, like a once-smart footman when he is no longer sufficiently juvenile for his office, progressing lower and lower in the scale of four-wheeled degradation, until at last it comes to—a stand! When Hackney-Coach Stands was reproduced in Sketches by Boz it included an accompanying illustration by George Cruikshank, titled ‘Coach’ and reflecting the passage ‘The servant-girl, with the pink ribbons, at No. 5, opposite, suddenly opens the street-door, and four small children forthwith rush out, and scream “Coach!” with all their might and main.‘.